Investing your money can be scary. Especially if you are new to it, but with low cost index funds is one of the easiest and most effective ways to invest your money. If you are one of our thousands of regular readers you know that we try to hammer home the point that you will probably only lose in the long term by picking individual stocks. After all, if professional hedge fund managers can’t do it reliably, there’s no reason to think you can. Most people never assume they can perform brain surgery better than a neurosurgeon, but as soon as the topic changes to the stock market everyone seems to think they are Warren Buffet. Just because a lot of people get lucky, doesn’t mean being good is easy. Come on now, people! If you are still convinced that you need to invest in individual stocks and there’s nothing that we can say to talk you out of it, at least make sure you have the tools necessary to do the stock research. 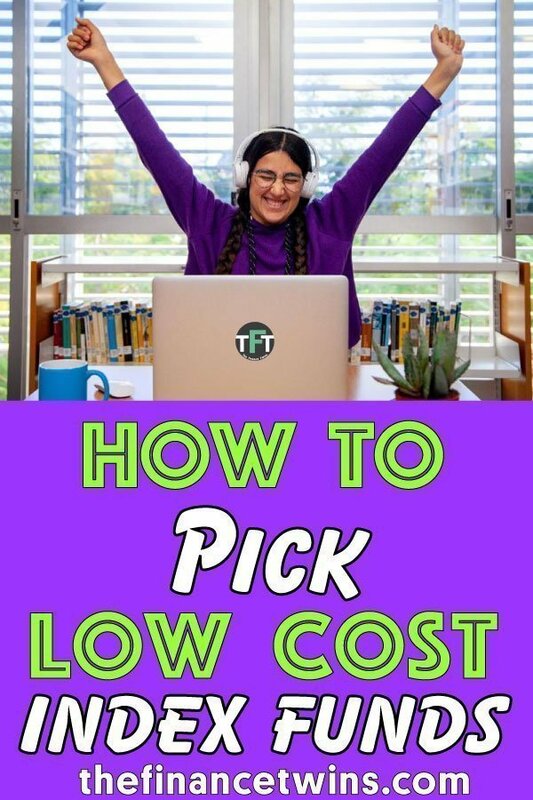 Let us show you how to pick low cost index funds. As we’ve mentioned, an index fund is a group of stocks or bonds that you can buy as a bundled. By purchasing an index fund, you will own a whole group of stocks, bonds or both. This will protect your portfolio from the risk of picking the wrong stocks. In an index fund, some stocks will go up and some will go down. However, as John Bogle, the late founder of Vanguard, has pointed out in his books, the stock market as a whole has always gone up over the long term. This means that if your portfolio (the entire group of all of your investments) reflects the broader stock market, your investment will grow over a long period of time even as some individual stocks go down. Since We Don’t Want To Pick Individual Stocks For Our Investments, How Do We Know Which Low Cost Index Funds To Pick? Thankfully, there are only a few things that we really need to focus on when selecting our investments. However, none is really more important than expense ratios, which are the fees you’ll pay. What Is An Expense Ratio For An Index Fund? The reason that the expense ratio is one of the most important factors is because every penny that you have to pay in fees is a penny that you will lose in returns. It’s as simple as that. You are giving your money away. To make matters worse, the fees will essentially compound over time so that you’ll miss out on an increasingly large part of potential investment returns. Assume you have friends who are identical twins and that they each invested $10,000 in index funds today. 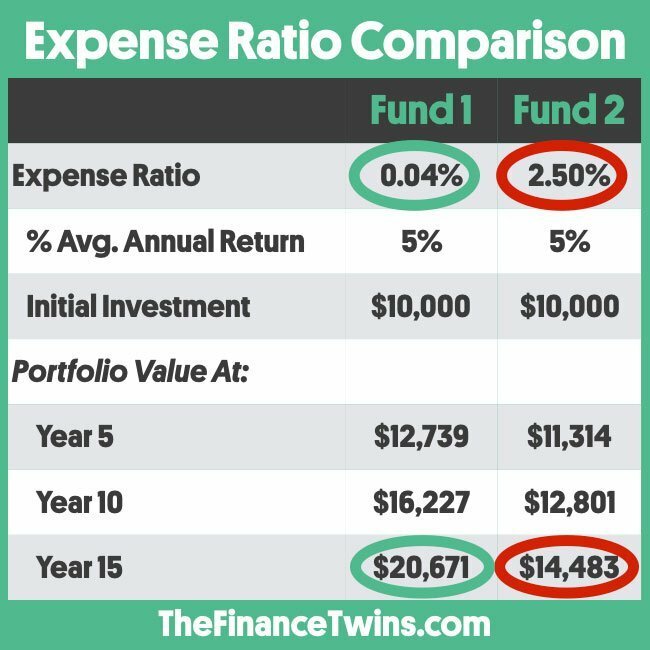 Both of their index funds will have the same investment return since they are invested in the same index funds, but they have different expense ratios. Fund 1 is a low cost index fund and has an expense ratio of 0.04%. Fund 2 is NOT a low cost index fund and has an expense ratio of 2.5%. At the end of 15 years, Fund 1 will be worth $20,671, while Fund 2 will only be worth $14,483. That “measly” difference of 2.46% in expense ratio ate up nearly 60% of the potential investment profit. What a shame indeed! We LOVE this example because it also highlights the difference in fees when picking individual stocks since the commissions you’ll pay to invest in those stocks or actively managed funds can go up to 3%. As that example highlights, learning how to pick index funds is easier than it seems. See the example below for those of you who are visual learners like us. In case that example isn’t clear, you’d have to consistently beat the market by 2.5% every SINGLE year in order to make up for the high fees. Seems kind of ridiculous, right? Besides Expense Ratios, What Else Matters When Picking Low Cost Index Funds? If you read our last article on why you shouldn’t pick individual stocks, you’ll remember the importance of buying a low cost total market index fund or a low cost S&P 500 index fund. 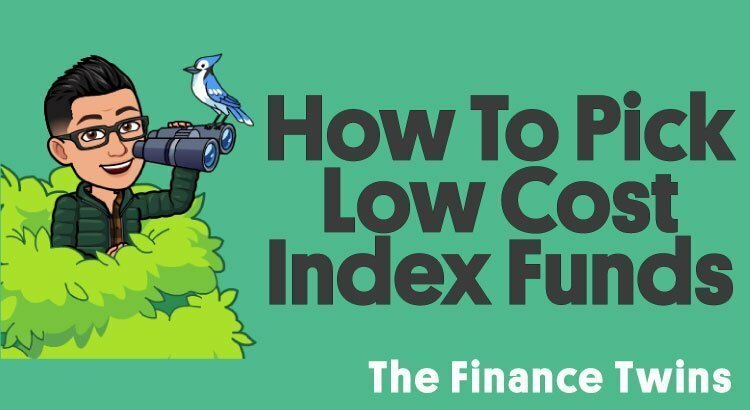 By picking a low cost index fund that contains stocks that represent the broader economy and contains stocks from all of the different industries, you ensure that you aren’t overexposed (or have investments that are too concentrated) in a few industries or companies. Not having a diversified set of investments can mean that you are taking much more risk than you realize and you could quickly lose a lot of money. It’s virtually impossible to predict when stocks will go up or down, so by regularly buying a diversified set of stocks, you negate the risk of making the wrong choices. Which specific index funds have low fees and represent the broader market? To begin, we want to queue the drumroll while we remind everyone that we are not investment advisors or broker dealers. What that means is that you shouldn’t rely solely on our information to make your investment decisions. With that said, below is a list of the low cost index funds we considered when we were deciding how to invest our own money. And it’s a good starting point for you. We aren’t advertising these securities, recommending them to you, and we certainly are NOT being paid in any way to list them or mention them to you. This is just showing you what we felt were great options for our OWN investment portfolios, because they represent the broader stock market and they have low expense ratios. As you now know, these are the two factors we feel are the most important when selecting a long-term investment strategy. Generally, the funds that correspond to your brokerage are the ones that will have the lowest fees for you. So, if you have a Fidelity account, you’ll probably mostly look at their own Fidelity index funds. For new investors, we love Vanguard’s long and storied history of low fee index funds. While Charles Schwab or other brokerages may raise their fees from time to time, Vanguard wrote the book on low fee index funds and they’ve consistently kept them that way. An exciting development from 2018 however, was the introduction of FZROX by Fidelity, which was their total stock market index fund with absolutely no fees! That’s right, it has an expense ratio of 0.00%! Now that you know how to pick index funds, let’s see what some of your options are. Here is another list of index funds that may be a solid addition to your investment portfolio. If you are curious about how to think about the split between stocks and bonds or even what a target date fund is, make sure to read our article on asset allocation! Do you feel confident that you know how to pick index funds? Thanks for the advice. I have a question regarding your index funds listed. From a cursory glance it seems that the Charles Schwab index funds would be great for new investors due to 1) your stated importance in low expense ratios at 0.03% and 2) the minimum investment at $1.00. You did state that Charles Schwab is more likely to raise fees compared to Vanguard but it seems like you could invest smaller amounts at a substantially reduced expense ratio using Charles Schwab compared to the other index funds. Could you let me know if Vanguard or Fidelity traditionally have a higher return than Charles Schwab to make up the difference in expense ratios? Thanks so much! Hey Thane– Thanks for the question. What you’re saying makes a ton of sense. You’re 100% correct about Charles Schwab having the lowest minimums and very low expense ratios. The difference in returns when investing in total stock market index funds really comes down to the expense ratios. Though Vanguard was the pioneer of the low-cost index fund, the other players are trying to get some of that market share by offering very competitive expense ratios. For this reason, they will likely also try to keep the expense ratios low. The key is to buy and hold your investments for the long haul. The shorter you hold an investment the higher the tax burden. By buying and holding for many years (5+) you will be minimizing the total amount lost to fees and taxes (however, if you’re investing in a Roth IRA, you don’t pay capital gains taxes since you’re putting in after-tax dollars). In terms of investing in Index funds vs. Roth IRA. Using after-tax dollars which one would be recommended? Hi Laymer, I am not sure I entirely understand your question. Index funds are an investment and an IRA is basically an account that holds your investments or that you use to make investments. So you can make after-tax investments in index funds. If I have a 401K through my employer with Edward Jones, can I still invest in a Vanguard fund? Hey Mike. It all depends on the types of investments your 401K provider makes available to you. Some will give access to the lowest fee Vanguard funds, while others won’t. You’ll just have to call your rep (or login and check online) to find out! Good luck! This is great information for my young adult children. As a 70 y/o retiree though, I think I am better served by a mixed portfolio of stocks, bonds and mutual funds. Agree? Hi Harry, thanks for your comment. You definitely want to keep a diversified portfolio. Common wisdom says that as you age you should slowly add an increasing amount of bonds to your portfolio. Our article on asset allocation does a good job of explaining the types of investments that we love and how the allocation can change over time.